The official trailer for Paramount Pictures’ Pet Sematary reveals big changes from book to screen. Stephen King’s bestselling novel was made into a feature film in 1989, and that film stuck close to King’s book. The 2019 adaptation will apparently switch up the family dynamics quite a bit, including changing the child brought back from the dead from the toddler son to young daughter. The ’89 horror film starred Dale Midkiff, Denise Crosby, and Fred Gwynne. The 2019 version features Jason Clarke (Dawn of the Planet of the Apes) as Louis Creed, Amy Seimetz (Stranger Things) as Rachel Creed, and two-time Oscar nominee John Lithgow (The World According to Garp, Terms of Endearment) as Jud Crandall. The cast also includes Hugo and Lucas Lavoie as Gage Creed, Jete Laurence (Friends from College) as Ellie Creed, and Obssa Ahmed (The Expanse) as Victor Pascow. Scream: The TV Series‘ Kevin Kölsch and Dennis Widmyer directed the horror film from a script by Jeff Buhler (Nightflyers). Lorenzo di Bonaventura, Steven Schneider, and Mark Vahradian produced, with Mark Moran executive producing. The behind the scenes team includes director of photography Laurie Rose, production designer Todd Cherniawsky, and editor Sarah Broshar. The horror film will close out the 2019 South by Southwest (SXSW) which takes place March 8-17, 2019 in Austin, Texas. Paramount Pictures is set to release Pet Sematary in theaters on April 5, 2019. 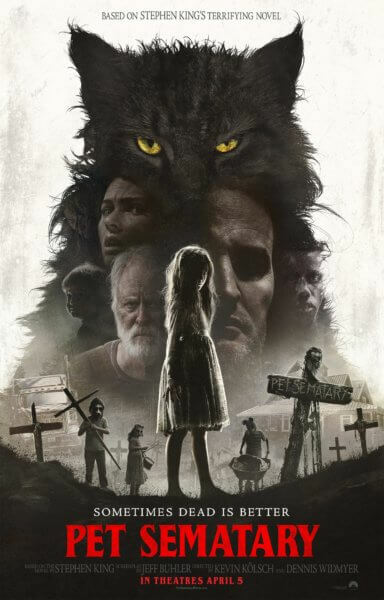 Based on the seminal horror novel by Stephen King, Pet Sematary follows Dr. Louis Creed (Clarke), who, after relocating with his wife Rachel (Seimetz) and their two young children from Boston to rural Maine, discovers a mysterious burial ground hidden deep in the woods near the family’s new home. When tragedy strikes, Louis turns to his unusual neighbor, Jud Crandall (Lithgow), setting off a perilous chain reaction that unleashes an unfathomable evil with horrific consequences.